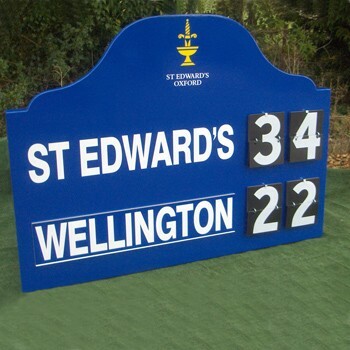 This sturdy football scoreboard is ideal for schools and clubs. A strong timber scoreface is fitted with 228mm x 305mm telegraph numbers to score up to 99 for each team. As standard the board is navy, but we can paint one to suit team colours as long as you specify on ordering. It is also possible to have the manual scoreboard customised with logos and titles - discuss your requirements with us to get detailed prices. We can also supply galvanised steel legs and sockets if required to provide fixings for the scoreboard. Illustrated is a customised scoreboard. As standard the scoreboard is rectangular.